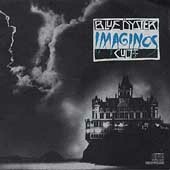 BLUE ÖYSTER CULT are not a band I've seen often but I have a few shows under my belt and some memorabilia to use for earlier shows. The main reason I've not seen the band more frequently is that they don't come over to the UK very often. Between 1989 and 1998 they appeared only twice in England, the Town 'n' Country in 1992 and the London Forum, towards the end of 1995. Europe faired better with three tours while America, unsurprisingly, was toured every year. I chose the logo above as it is from my favourite BÖC album, Imaginos. Wouldn't it be great if real live music had a chance of being represented in the Top of the Pops Awards. Well, if you click through on the link to the left there is a small chance we can achieve just that. OK, down to the business in hand, the shows I've seen. I've added track lists here as they are raedily available from the official BÖC site. Linked venues lead to reviews. Burnin' For You, Cities On Flame With Rock & Roll, Eti, Harvest Moon, Buck's Boogie, O.D. 'd On Life Itself, The Vigil, Live For Me, Flaming Telepaths, See You In Black, Then Came The Last Days Of May, Lips In The Hills, Godzilla, (Don't Fear) The Reaper, Dominance & Submission. BLUE ÖYSTER CULT Milton Keynes Stables 14 May 2002 . BLUE ÖYSTER CULT London Astoria 17 May 2002 . I wonder if it will be another four years before the band return to these shores? I found a site that lists the set from each night of the UK tour here. A staistical analysis is here. It seems that I made it to the two evenings with the fewest tracks played. Maybe BOC don't like the South of England much? This page is Copyright © Doug Anderson 2000 - 2002. Created: 19 May 2002. Last updated: 15 November, 2002.